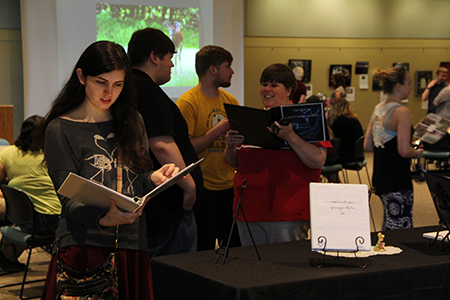 A large crowd turned out to view the work done by the Cowley College photography and writing students during the Life: Through Word and Lens event held Thursday in the Earle N. Wright Community Room. Cowley writers from Journal Writing/Storytelling, Fiction Writing and Focused Seminar presented writing portfolios and final projects for those graduating this month. Creative writing students participating were Cassie Anderson, Lilia Bowman-Bekemeyer, Daltin Brock, Austin Crowe, Tim Hardman, Nancy Lartey, Christina Leithoff, Tori Mann, Sabrina Masters, Lucia Morales, Katie Rethmeier, and Maren Zimmerman. Some of the students presented their works for those attending the event. Photographers that had their works displayed were Kayla Schenck, Kayla Powell, Maren Zimmerman, Sarah Bryant, Sam Crowl, Mitch Hoover, Amelia Doyle and Arlen Wilson. Each student was tasked with selecting 8-10 images they took this semester, providing a business card, flyer or leave-behind and creating art tags for each piece. They selected the theme “Adventure Awaits” which is reflected in the table décor. The images were for sale and will remain on display through the end of finals week.